Containing bio-enzymes, this product completely removes residual cat urine smells. When you suddenly find your beloved cat urinating inappropriately around the house you will know you have a cat behavior problem on your hands. There are many possible causes for such behaivor, and it can be very stressful for both you and your cat. urineFREE All-In-One Odour and Stain Remover will help eliminate some of the stress, because, as the name suggests, it totally eliminates all stains and odor from urine on household surfaces. Other cleaners only work on the surface which means that the smell remains, but urineFREE is a bio-enzymatic cleaner, so the smell and stain will be gone forever no matter how long it has been there. It even works on carpet and upholstery! 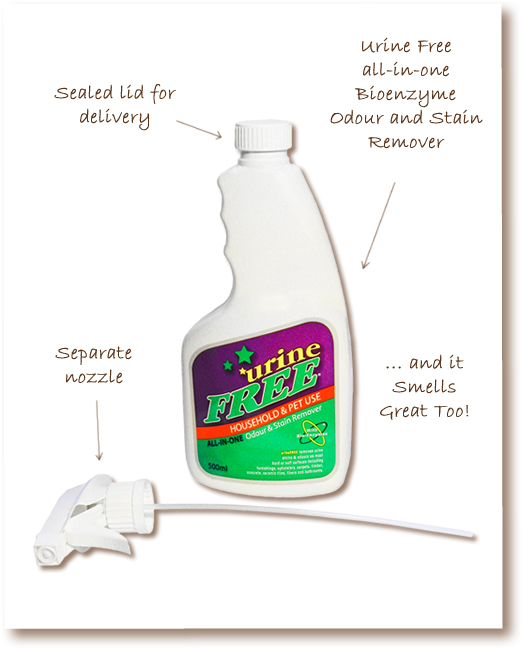 Take the stress out of the mess today, and buy urineFREE All-In-One Odour and Stain Remover. Available in a handy 500 ml spray bottle, economical 1 liter spray bottle, or for greater economy to clean up all those old messes and to help the environment, it is also available as 2 liter, 5 liter or 10 liter refills (5 and 10 liter refills available on request, please email us). 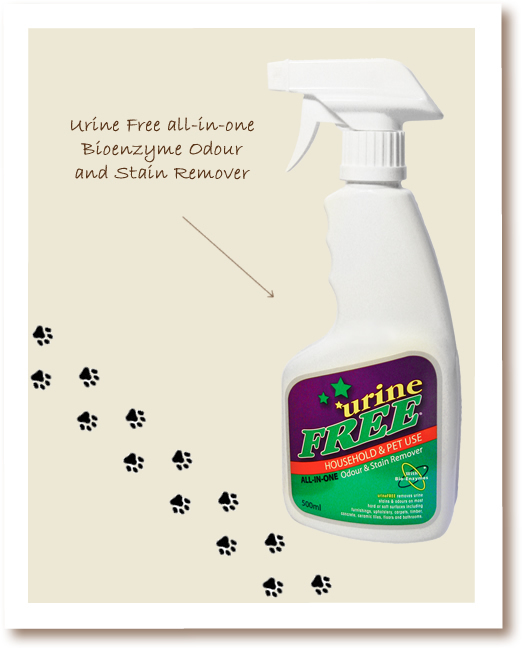 We recommend the urineFREE Urine Detector is used in conjunction with urineFREE All-In-One Odour and Stain Remover, so you can accurately locate where cat urination has taken place and ensure that all areas are clean and odorless. This will not only make your home smell better and be more hygienic, it can also deter your cat from urinating there again. A possible cause of inappropriate cat urination is a urinary tract infection. To learn more about this, read our article Feline Urinary Tract Infection.